Athetoid/dyskinetic cerebral palsy occurs in about 0.27 per 1,000 live births (1). It is the second most common type of cerebral palsy. ADCP is characterized by damage to the basal ganglia, a part of the brain involved in movement control. This damage is usually the result of hypoxic-ischemic encephalopathy (HIE) or kernicterus (2). Other terms for this type of CP include ADCP, athetoid cerebral palsy, and dyskinetic cerebral palsy. 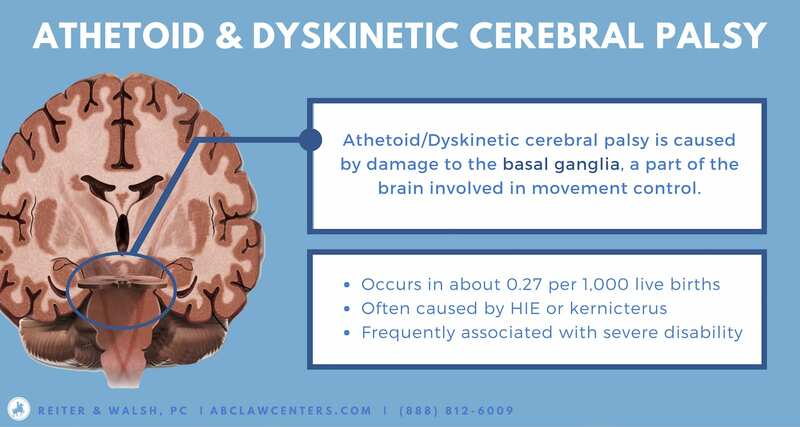 The most common cause of athetoid/dyskinetic cerebral palsy is hypoxic-ischemic encephalopathy (HIE), a birth injury in which an infant’s brain is damaged due to oxygen deprivation and/or insufficient blood flow. It also often results from kernicterus, a type of brain damage that can emerge in babies with improperly-treated jaundice and elevated bilirubin levels. The specific areas of the brain that are impacted depends in part on whether the damage is a result of HIE or kernicterus (2). Athetoid/dyskinetic cerebral palsy is characterized by lesions in the basal ganglia. Affected nuclei may include the subthalamic nucleus, caudate, putamen, and globus pallidus. The lentiform nuclei, which includes both the putamen and globus pallidus, is consistently involved in ADCP. Some people with ADCP have mainly putamen injury. Others have lesions in both the putamen and globus pallidus, which can be referred to as “panlenticular damage” (3). Most infants who develop athetoid/dyskinetic cerebral palsy exhibit signs of fetal distress shortly before or during the birthing process (2). They also often require assisted ventilation at birth – this occurs at higher rates in babies who develop ADCP than those that develop spastic or ataxic cerebral palsy (4) . Sometimes chorea and athetosis co-occur; this is known as choreoathetosis (5). Children with ADCP may experience frequent changes in muscle tone: one day a muscle may be too tight, and the next too loose (6). These fluctuations are influenced by attempted movements and changes in emotional state (1). Walking. 79% of children with ADCP are unable to walk independently (7). Speaking. In one study, 38 out of 48 children with ADCP were unable to speak coherently (4). Many children with ADCP also have seizure disorders and intellectual/developmental disabilities. The frequency of these two conditions is positively correlated with the severity of motor impairment (8). Athetoid/dyskinetic cerebral palsy is often not diagnosed until a child misses certain developmental milestones, and some of the signs and symptoms (discussed above) become more evident. At this point, physicians should perform clinical assessments. Magnetic resonance imaging (MRI) is typically used to confirm diagnosis of the extent and location of the brain injury. However, detection rate for ADCP has been reported to be as low as 54.5 percent (9). Although athetoid/dyskinetic cerebral palsy is not a curable condition, it is often preventable. Medical professionals should be aware of risk factors for birth injuries, and take measures to stop them from occurring by performing timely deliveries. Even after an infant has sustained a hypoxic-ischemic injury, it may be possible to prevent or minimize long-term harm by promptly administering hypothermia therapy. Likewise, kernicterus can easily be avoided with appropriate treatment for jaundice and hyperbilirubinemia. Once brain damage from hypoxic-ischemic encephalopathy or kernicterus has set in, it cannot be reversed, but there are still important treatments and therapies that can help to alleviate the symptoms of athetoid/dyskinetic cerebral palsy. Treatments frequently given to children with spastic cerebral palsy, such as botulinum toxin (botox) injections, baclofen, and surgeries such as selective dorsal rhizotomy (SDR), may not be as effective in patients with ADCP (10, 11, 12). However, some types of therapy that are used to treat other forms of cerebral palsy can also be very helpful for children with ADCP. Among others, these include physical therapy, occupational therapy, and speech therapy (2). It is important to note that speech therapy can also improve eating/swallowing ability. Although it has not yet been approved by the FDA, deep brain stimulation (DBS) has also been shown to improve outcomes in children with ADCP (13). DBS is done by placing electrodes in the brain, as well as a neurostimulator implanted in the chest. The neurostimulator sends pulses that help to regulate abnormal brain activity patterns. It functions similarly to a pacemaker used to control heart activity (14). In the future, this may be a more common treatment for ADCP. ADCP often emerges as the result of malpractice. Medical professionals sometimes fail to recognize and promptly respond to pregnancy complications, which can cause birth injuries and subsequent cerebral palsy. Alternatively, they may perform interventions that unnecessarily put the baby at risk: examples include inappropriate use of forceps and vacuum extractors or labor-assisting drugs like Pitocin or Cytotec. Finally, failure to properly treat jaundice can cause a baby that could have been completely healthy to develop ADCP. Birth injury is a difficult area of law to pursue due to the complex nature of the medical records. 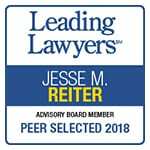 The award-winning birth injury attorneys at Reiter & Walsh ABC Law Centers have decades of joint experience with birth injury, hypoxic-ischemic encephalopathy (HIE), kernicterus, and cerebral palsy cases. To find out if you have a case, contact our firm to speak with one of our lawyers. We have numerous multi-million dollar verdicts and settlements that attest to our success, and no fees are ever paid to our firm until we win your case. We give personal attention to each child and family we help, and are available 24/7 to speak with you.